The Fault2SHA ESC (European Seismological Commission) Working Group hosted a session on Wednesday 5th September at the ESC 2018 Meeting held in Valletta, Malta. Oona Scotti represented the group in her keynote on the opening day of the conference, in which she addressed “Modelling fault systems in PSHA: Challenges Ahead”. The Fault2SHA Working Group, for which I am on the Executive Committee, links different researchers working on faults and seismic hazard assessment (SHA) in Europe and beyond. This collaboration has brought together field geologists, fault-modellers and probabilistic seismic hazard modellers. The group provides a forum in which data, results, modelling capabilities, and improvements in scientific understanding can be shared. If you want more information, and to join, see Fault2SHA. The next Fault2SHA workshop will be in Kaust, Saudi Arabia, in November 2018 and the next meeting will run on 3rd-5th June 2019 in Barcelona, Spain. I lead the Fault2SHA Central Apennines Laboratory. Our team comprises researchers from Italy (Paolo Boncio, Bruno Pace, Laura Peruzza, Francesco Visini), France (Lucilla Benedetti, Ooona Scotti) and the UK (Joanna Faure Walker, Gerald Roberts). At ESC in Malta, I introduced the central Apennines Laboratory and our current activities to the wider working group. The Central Apennines, as well as being a beautiful place to conduct fieldwork with the opportunity to obtain detailed datasets, suffers from large magnitude earthquakes. Indeed, earthquakes in the Central Apennines have featured widely in the UK press due hosting the two deadliest earthquakes in Europe of the last ten years: the 2009 L’Aquila sequence and the 2016 Amatrice-Norcia sequence. 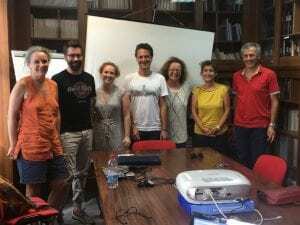 The Fault2SHA Central Apennines Laboratory, which formed in January 2018, held an in-person meeting in July at the University of Chieti-Pescara, Italy. The photograph shows (from left to right) Oona Scotti, Francesco Visini, Joanna Faure Walker, Bruno Pace, Laura Peruzzi, Lucilla Benedetti, and Paolo Boncio. During the Fault2SHA ESC session, I presented a second talk and a poster about my research investigating the importance of incorporating detailed fault geometry for understanding seismic hazard. The oral presentation demonstrated the importance of incorporating detailed fault geometry and loading on faults between earthquakes in Coulomb Stress Transfer modelling, a process that causes the stress on faults to change in response to an earthquake on a neighbouring fault. This was based on work carried out by Zoe Mildon (former IRDR PhD student, now a lecturer at the University of Plymouth) in collaboration with Gerald Roberts, Shinji Toda and myself (see Midon et al. 2016 and Mildon et al. submitted preprint). The poster displayed the importance of detailed fault geometry and slip-rate data for calculating earthquake probabilities and ground shaking intensities. I further represented Zoe for her poster within the session on earthquakes in regions of distributed deformation, that showed surface ruptures from the 1997 Colfiorito Earthquake in the central Apennines was due to primary earthquake slip (see Mildon et al., 2016 for details). I thank all those at the conference with whom I had interesting discussions and I look forward to seeing all of our research progress.